Surprising aesthetics in bold shapes for a unique style. Bejewelled volumes. The art of gem-setting to magnify the beauty of one-of-a-kind creations. These elements are at the core of Audemars Piguet‘s High Jewellery watch trilogy. This is the motto for Audemars Piguet in 2017. Defying once again conventions and common practice, the Manufacture based in Le Brassus unveiled to the world, at the Salon Internationale de la Haute Horlogerie (SIHH), the Diamond Outrage, the last chapter of their High Jewellery watches trilogy. Never a name has been more appropriate. Indeed, Diamond Outrage defies the aesthetics and the classic rules of style, setting itself completely apart from the protagonists of high jewellery scene, and standing out in the most dramatic way. Diamond Outrage high jewellery watch, Audemars Piguet, full diamond model, open. The inspiration for the design of the Diamond Outrage comes from the view of the Vallée de Joux in winter, under the white snow – for the white diamond version – or under the enchanting reflections of light at the night – for the blue sapphire version. This cuff watch evokes the pines covered with snow and the diamond’s different cuts add to the fascination. The brilliant-cut diamonds (circa 50.06 carats) are set with the snow-flake technique, whilst the baguette-cut diamonds (circa 15.85 carats) on three of the spikes are set with the mystery set technique, an exclusive setting that makes the white gold structure disappear and be totally luminous. Diamond Outrage is a one-of-a-kind creation endowed with a sculptural force of its own. The journey towards the “outrage” started in 2015, with a certain rock attitude. Diamond Punk was the first chapter of the trilogy, introducing the Manufacture’s bold approach to high jewellery watches, demonstrating that “there are exceptions to every rule”. Diamond Punk breaks the rules with its design, characterised by the rhythmic succession of 56 pyramidal studs, set with 7.848 snow-flake-set diamonds (33.35 carats), conveying the outburst of energy of the Punk era and a new design code. A sliding element unveils the secret watch, which dial is set with 300 diamonds (0.92 carats). The punk attitude evolves into a furious one, with Diamond Fury, launched in 2016 – the second chapter of the trilogy. Diamond-set studs evolve into a shield of brilliant-cut diamonds. A strong and solid bejewelled talisman that, also in this case, protects its secret: a secret watch that is revealed with one light and simple touch. 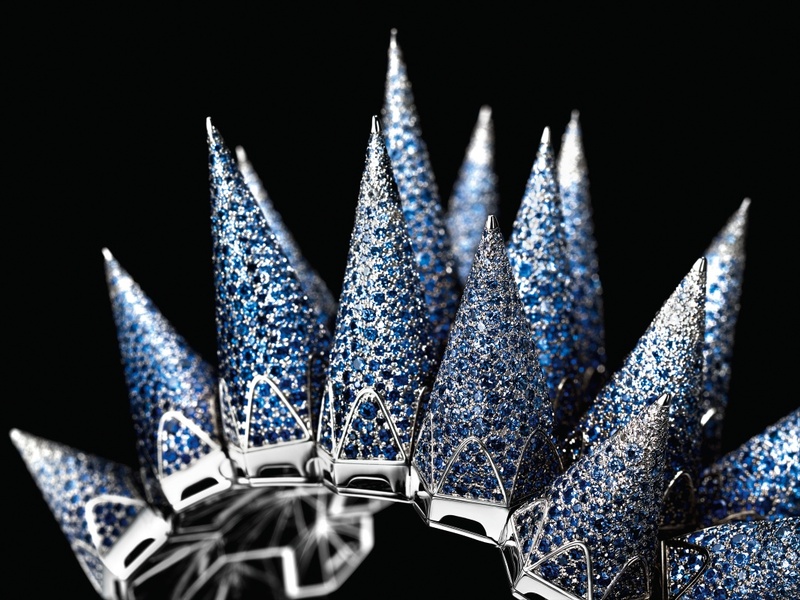 Diamond Fury is the result of 1.500 hours of work of designers, watchmakers and jewellery artisans. They designed a white gold armour set with 4.635 brilliant-cut diamonds for a total of circa 25.60 carats and of circa 0.54 carats on the dial.